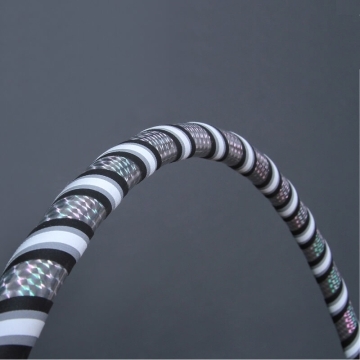 At first glance on the product image, you will be able to see why this model is called Design Hula Hoop or exclusive Hula Hoop: In careful handwork (made in Germany), each Hula Hoop is designed elaborately, what can truly been seen and felt as well. The exciting appearance impresses with a mixture of black, white, gray and silver, the attractive hologram pattern ensures an appealing effect. In addition, Grip Tape has been fixed on the inside in a very precise way. 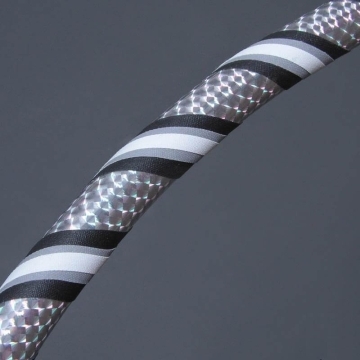 This actively improves the adhesion of the Hoop. You are a beginner? Then the grip tape will be a significant help to learn the technique quickly. To allow this in every way, you can choose a diameter of 80, 90 or 100 cm when ordering. Do you like it expressive and functional? This Design Hula Hoop will inspire you! Here waits an exclusive Hula Hoop to fly around your hips in order to bring more momentum and balance into your everyday life. Each visual and functional detail has been designed to provide a tangible value in the training routine: In this sense, the practical snap buttons allow using this model as a modern Travel Hoop. You can significantly reduce with a few simple steps the Hula Hoop significantly in size for a space-saving transport. We make it possible to fulfill your personal desires with a view to an individual diameter: Simply contact our support team for a perfect Hula Hooping experience!